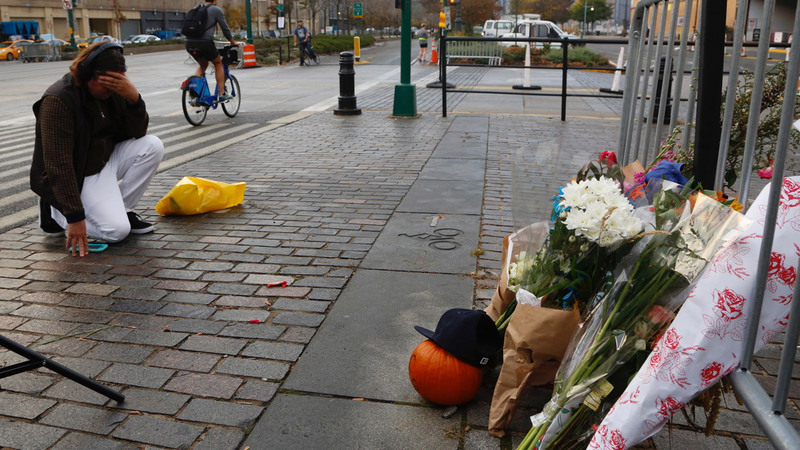 LOWER MANHATTAN, New York (WABC) -- Flowers and condolences are beginning to fill a corner along the bike path in Lower Manhattan where the driver of a truck mowed down pedestrians and bicyclists in a Halloween terror attack, all while symbols of resilience are appearing across New York City. The location of the makeshift memorial is Chambers Street and West Street, near the scene of Tuesday's rampage that left eight people dead and 13 injured. Many people have stopped by to offer their condolences. Also on Chambers Street, a "ghost" bike painted in all white has been placed near the scene. This is part of a Street Memorial Project that honors cyclists who have been killed on New York City streets. Symbols of New York City's strength and perseverance are also appearing across the city. People have been posting encouraging messages on social media using the #NYCstrong hashtag. On West 80th Street on Manhattan's Upper West Side, a balloon banner that reads "NYC STRONG" stretches across the road. Have you seen any other tributes to the victims around the city or around the world? Send us your photos on Instagram and Twitter using the hashtag #abc7NY.